Babson College has embarked on its second century as an entrepreneurial leader in education and is undertaking renovations on its Wellesley campus to mark its Centennial. 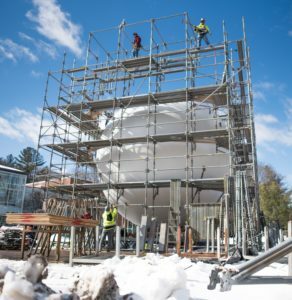 The refurbishment and relocation of the historic Babson Globe is one such project. 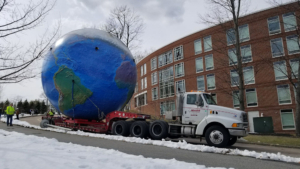 Built in 1955, the Globe has resided outside of Coleman Hall, serving as a representation of founder Roger Babson’s vision for the worldwide impact of the college’s mission. Once restored, the Globe will be relocated to Centennial Park, a centralized community space at the heart of the campus. Plans for the project got underway in the fall of 2017 when Babson and general contractor Lee Kennedy Co. Inc. began meeting regularly with various subcontractors, including Marr Crane & Rigging. Marr was tasked with moving the Globe onto a trailer and providing transport to a temporary location while the carriage it rests on was fully repaired. Marr then transported the carriage to Centennial Park where it was installed and readied to receive the Globe. The Globe remained on the trailer for 10 months where it was sand blasted and white washed in preparation for a newly painted finish. Once Marr Crane & Rigging set the Globe in place at Centennial Park, Marr Scaffolding Company worked for Lee Kennedy Co. Inc. to scaffold the exterior of the Globe for repainting. Over two weeks, an average of three crewman installed systems scaffolding following the contour of the Globe, exactly one foot off the exterior with plank every seven feet. At 40 feet high, scaffold installers bridged over the Globe’s North Pole with a truss system to support the roof (comprised of plank and plywood). 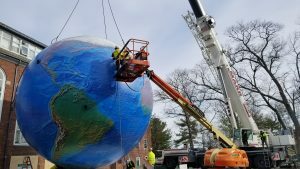 Due to the cold temperatures and the delicate nature of the repainting process, the Globe was fully enclosed and heated for work by the specialty painters. 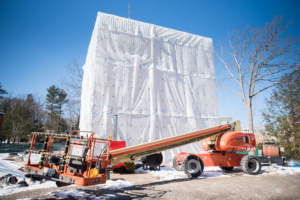 The scaffold will remain in place until work is completed prior to Babson College’s Centennial Commencement. Archimedes once said, “Give me a lever long enough and a fulcrum on which to place it, and I shall move the world.” Marr used a crane, but he was correct.